Brew Facts: This is another stealth beer as Great Divide’s Web site makes no mention of it. I wouldn’t consider this to be a rare find, I’ve seen it in the Philly area a few times, but I shared this bottle with a bar manager and apparently even the reps for Great Divide do not list it. I guess if you aren’t near the brewery and want to try it, grab it when you see it. Appearance: Pours a deep, rich brown, that doesn’t gather a head. Light can penetrate this just enough to reveal a haze-less ruby reddish luster. Doppelbocks tend to be darker, like a mix between an amber lager and a porter, but this has a complexion more inline with a Barley Wine. A rather pleasant and delectable hue if I do say so. Aroma: Following up a quick sniff with a deep inhale finds an aroma heavy with malts that give off the slightest smoke. This sampler of sweet smells moves through the raisin, brown sugar/maple, and toffee notes typical to a Doppelbock. One gets the impression that you’re in for a blood sugar spike after sipping on this. Taste/Mouth Feel: A quick drink and the first impression is lightly carbonated and heavily malted, like a super-powered English Strong Bitter. I’m mildly surprised by the carbonation, which should be dialed up as the sweet grain bill gives this a slick, near syrupy mouth feel and could use the bubbles. The flavors are toffee malt, and when I say “toffee malt”, it’s like drinking melted Werther’s Originals™ straight out of grandma’s candy dish, with a finish that briefly juggles roast and raisin to nice effect. While the finish isn’t necessarily dry, it doesn’t stick around long. Many malt intensive beers can fatigue the tongue with sugar, but I’m glad to say that’s not the case here. Final Thoughts: I wasn’t entirely sure what to expect coming into this one. Bocks tend to be rather indulgent malt beasts that need a long time of bottom fermenting to mellow out. Well, Great Divide waited long enough and created a smooth beer with a toffee body, backbone and full skeletal system, but without the over sweet. The phrase “over sweet” is important here as an earthy sweetness is still a key player, but in a drinkable, ESB kind of way. 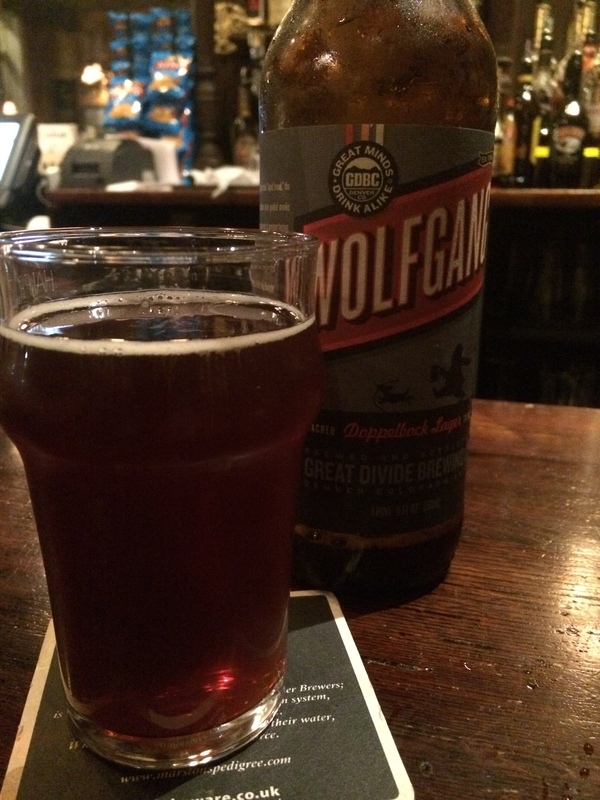 Whether that’s good or bad is up to you, but Wolfgang shares enough traits with malty Doppelbocks and English pub beers to potentially satisfy both crowds.